I just ordered these trousers from H&M! (I'm sorry that I have to tell you that I bought something AGAIN, hihi, but it was very necessary, I just had to) I saw it on their webshop, and I fell in love with them hihi! I really like printed leggings or trousers for a while. Prints are very lovely and they are nice to combine. Normally you have a printed shirt and simple bottom but the other way around is prettier! It's also something different. And actually, you can wear printed bottoms with everything! (At least, that's what I think) I hope they will arrive soon, cause I can't wait to wear them. I already planned some outfits with the trousers :) What do you think about printed bottoms? And do you like this one? Leuke broek, al zal ik hem zelf niet dragen denk ik, haha! Wat een ontzettend leuke broek, het heeft iets weg van een barok printje i really like! Dat shirt vind ik echt tof omdat hij dan zo lekker losjes valt! Erg leuke broek, en die outfit in die collage is heel leuk samengesteld! Wat een ontzettend leuke en frisse blog! 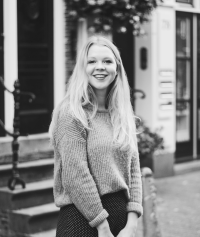 Zou je alsjeblieft een kijkje willen nemen op clubsassy.blogspot.nl, ik ben net begonnen met bloggen en moet alles nog een beetje uitvinden maar ik heb al genoeg posts om te lezen zeg maar! zo'n combi is echt heel leuk! hele leuke broek ,goeie keuze! Ooooeeeh dat is een hele mooie broek! Leuke combi! Is de zonnebril ook van de H&M? I love H&M and this looks amazing! First give-away: Win a Cover It Up Iphone case!